During the sacrament of Holy unction the priest anoints with Holy oil Orthodox Christians. According to the teachings of the Church during the anointing of the sick (extreme unction) for a person descends the divine grace, which is able to heal various ailments. After this sacrament, the believer is dealt consecrated oil that can be used as a great Shrine of the miraculous in the everyday needs. There is a pious custom to take to their homes after participating in the sacrament of Holy unction is consecrated oil. During the sacrament in oil (as in the Church tradition referred to as oil) is added a little wine. 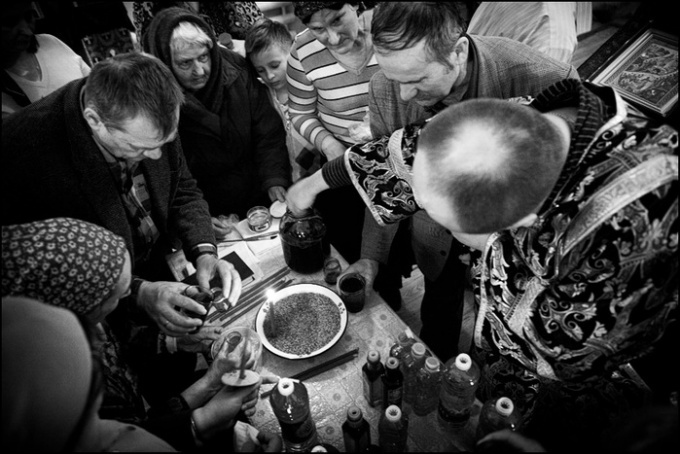 The resulting liquid is mixed and anoint her Orthodox believers. In worldly needs consecrated oil is used for promazyvanija sores. It is desirable that the person had a special brush that is only used for promazyvanija Shrine. If a person is sick some part of the body, you can cross apply a light coat of oil. This is done with a special reverence and prayer. Orthodox Christians believe a conciliar oil helps to cure disease. In practice seen cases where after promazyvanija the wounds heal faster, and sometimes serious diseases were cured. Cathedral oil can smear any place. In addition, you can make a variety of headbands, which bandages moistened in the Cathedral oil. There is a practice of adding Cathedral oil consumption. Some people even prepare the Cathedral for oil, believing that food is sanctified. This practice is quite logical and legitimate from the point of view of the Church. However, you need to understand that the conciliar oil will be effective only for the person who took the sacrament of Holy unction. So, for people who did not participate in extreme unction, the oil would not help in various ailments, but by itself the oil will remain consecrated. That is, the oil will be really Holy, but without an effective force, took part in the last rites. Cathedral oil cannot be used in magical rituals, rites and divination, as a Christian Shrine for this kind of classes are not to be believers. The consecrated oil should be stored in a clean place. For example, next to the icons and Holy water.